The Lutron CW-1-WH screwless wall plate, 1-gang, decora style offers an ideal solution for homeowners looking to update the décor of their walls. This affordable Lutron Claro® 1-gang screwless wall plate in white provides a streamlined look since the unit has no visible screws. The Lutron screwless wall plate is a two-part configuration; a backing plate attaches to the wall with screws, then a front vanity plate snaps on to the backing plate to complete the screwless look. The highly durable Lutron CW-1-WH wall plate is made from tough thermoset, guaranteeing that your wall plate will maintain its original white gloss finish for years. The smooth finish is also very easy to clean and a quick swipe with a damp cloth is all that is needed to make this wall plate shine. The neutral white color goes well with the decorating scheme of any home. 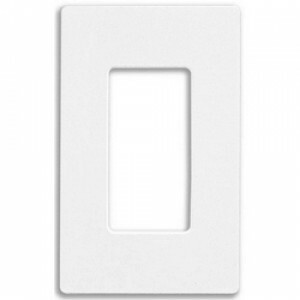 The Lutron CW-1-WH wall plate can easily replace any existing standard wall plates within your home and is compatible with most large toggle light switches or dimmers. The plate has been designed with generous overhang to hide any gaps that may exist between the drywall and the wall box of the switch. Lutron makes the best products for the money. We've used these for years. They look great. Be careful not to break them when installing them. This is a great value product. Makes the client really love the final result.